Kristen (Julie Austen) is unknowingly the last pure blooded Aryan who just happens to cut her hand during a faux pagan ritual meant to show her distaste for Christmas. The spilled blood summons an evil elf who figures into a far reaching Nazi plot that involves her grandfather and selective breeding between elves and humans to create a master race. Mike McGavin (Dan Haggerty) is an alcoholic ex-cop working as a mall Santa. Kristen takes advantage of her lame food court job and has her friends over for an after-hours party. The Nazis and the elf show up to take her away but what they haven’t counted on is the now homeless mall Santa who has been secretly sleeping in a back room. 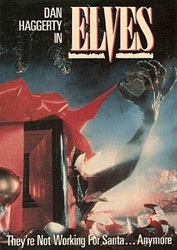 The plot of “Elves” is played as straight as can be, there is never even slightest acknowledgement that maybe…just maybe, this perhaps the silliest thing ever made, and that is its saving grace. Everything is played with such deadly earnestness; Dan Haggerty even manages to create a character that is sympathetic, which a small triumph when he’s acting against a rubber elf monster. There is a surprisingly cruel and perverse streak running through the film which dampens the silly fun of it all. Thankfully it recovers by the third act which sees the monstrous elf needing to copulate on Christmas Eve with Kristen, and a drunken Dan Haggerty punching Nazis in the face. Dan Haggerty at his absolute best. Elves is a classic. It's becoming somewhat of a tradition for me to watch it around Christmas, now.